Spencer Industries Incorporated is proud to receive a Hunter Engineering Company 2008 Supplier Excellence Award for their outstanding Quality and Service. The criteria for selection of this award included the reject rate of parts shipped as well as the number of lots rejected during 2008. 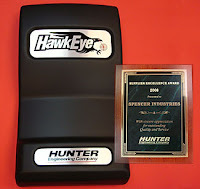 Hunter's business with Spencer Industries nearly tripled from 2007 to 2008 due to the addition of new cartons they supply for HawkEye systems. From a service standpoint, the team at Spencer has been consistently proactive in addressing issues before they arise while handling those that do arise in a very timely fashion. In addition, Spencer has a firm understanding of Hunter's stringent quality requirement and has supported this requirement with a .50% reject rate and a 1.02% lot reject rate. Spencer also worked with Hunter on a release system that is controlled by their plant which has proven to be successful for both. Spencer is a unique custom thermoformer because they can be a complete supplier to customers. Their added in-house Extrusion and Assembly capabilities allow them to streamline the product. This in turn is reducing leadtime and eliminating added costs for the customer. Spencer Industries is proud to be a complete supplier for Hunter Engineering.